One of my favorites and this is a very popular Indian recipe. 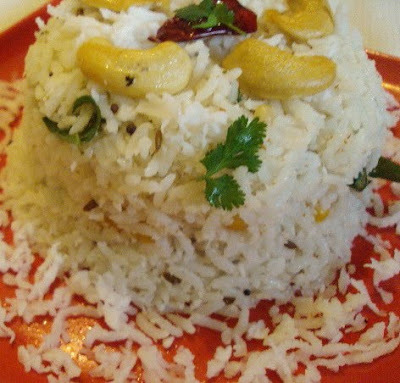 Fried coconut and seasonings are added to cooked rice and garnished with ghee roasted cashew, curry and coriander leaves. 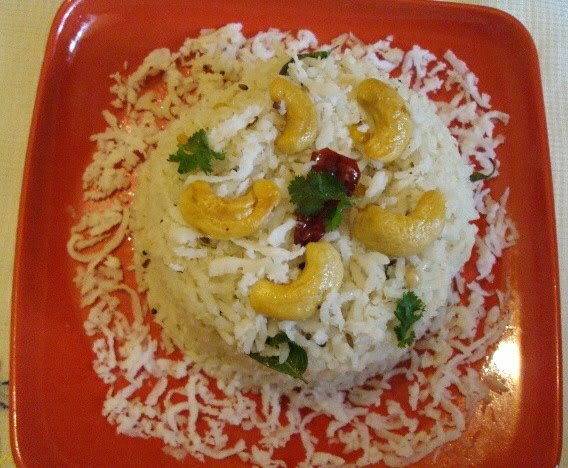 This dish is very easy to prepare and tastes mind blowing, if you have fresh grated coconut. Also this serves as a perfect recipe for any special occasion coz of its rich flavor of toasted coconut in ghee. It pairs best with spicy potato fry and hot chips. Wash and soak raw rice for 10 mins. Pressure cook it and allow to cool. Add a tsp of gingely oil and spread in a bowl. Heat 2 tbsp of ghee in a fry pan. Add coconut flowers and sauté in low flame. Roast cashew nuts to golden and take aside. Fry mustard, split urad dal, gram dal, cumin seeds, curry leaves, asafetida and red chilly. Now mix, rice, coconut flowers, seasonings, cashew and salt. Delicious and healthy coconut rice ready to taste. Sending this to Neha 's lovely "Kids menu event"
Lovely recipe and it looks very easy too. This looks delicious! I will save it and can't wait to try it. My husband LOVES coconut! Delicious Rice Jay..wanna taste it now.. Such a delicious and healthy rice dish! I love it. One of my favorites... Coconut rice! This's simple & looks delicious! This rice will be great with most curry dishes. Jay this sounds so good! I am definitely going to make this! delicious rice..love the flavor of this rice...beautiful presentation. My favorite too...Stopped preparing preparing it due to the quality of coconuts I get here..Looks so delicious Jay !! coconut rice looks delicious...lovely presentation. wow, that looks beautiful, I love cashews decorated on top. 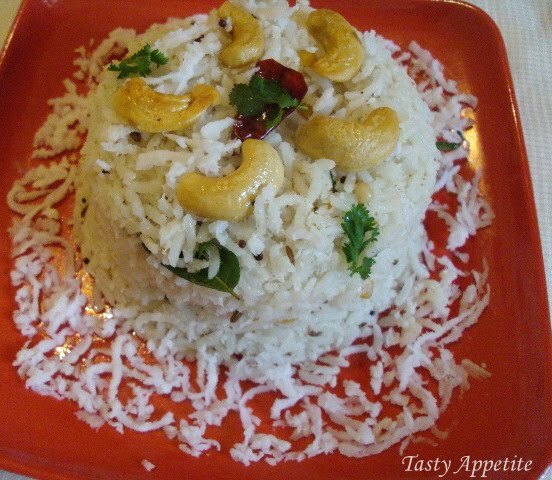 would like to have that with any non-veg curry..
Yep this is mind blowing, love coconut and rice together!!! That's a one yummy coconut rice. Nice one. droolworthy and yummilicious coconut rice with a lovely click. My all time favourite rice, just love with papads..yumm! rice looks so yummy and healthy..
thanks for sending this to my event. I will try the recipe and repost it on my blog.. I too make very similar way! Love it! I like this rice. super presentation!! I like it so much. especially with a mutton side dish. awesome! will make it tomorrow! I have a coconut to use, thought of making some sweets, you tempted me! I do not have the cashews at the moment, will use peanuts! I love coconut rice and coconut chutney.